IBASSIN: 2017 Toyota Bassmaster Angler of the Year Championship Day 2: Palaniuk Keeps AOY Lead; Combs Leads with lbs! 2017 Toyota Bassmaster Angler of the Year Championship Day 2: Palaniuk Keeps AOY Lead; Combs Leads with lbs! Last second giant keeps Brandon in AOY. 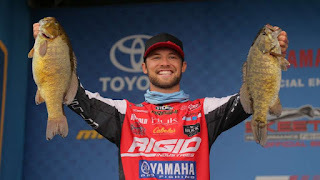 After two days of the Toyota Bassmaster Angler of the Year Championship, Brandon Palaniuk is still clinging to his lead in the race for the AOY season title. The noted smallmouth specialist from Hayden, Idaho, caught just 10 smallies from Mille Lacs LakeFriday — and if hadn’t been for a 6-pounder that bit extremely late, he might have actually fallen out of the AOY lead. The full field will fish again Sunday to determine the AOY Championship and the event winner. Takeoff will be at 6:50 a.m. CT from Eddy's Resort, and the final weigh-in will be held at 3:45 p.m.at Grand Casino Mille Lacs.